Dangol’ baseball funnyol’ game, man. Dangol’ Royals beatin’ the Blue Jays, manya just don’ know what you’ll see on any given night man. The Royals had won three series openers since June 1, all started by Danny Duffy. The last non-Duffy series-opening win came May 18. The Royals have been awful in series openers in 2018 is what you should be getting out of this. But then you’ve got Brad Keller stomping out and continuing a season that has defied all but the most optimistic of expectations; Rule 5 draft picks don’t typically turn into the most dependable starters on an MLB team, even one as bad as the Royals. And yet… tonight he moved to 5-5, dropped his ERA to 3.40 and scattered four hits and one run against the Blue Jays, who are nobody’s idea of a contender in 2018 but still have plenty of firepower in… wait, who the heck are THESE guys? Where’s Josh Donaldson? Wither Troy Tulowitzki? If things are so bleak Randal Grichuk is acting as your clean-up hitter, it’s safe to go ahead and make those October plans now. I digress. Just because Keller got to pitch to the baseball equivalent of the “Wednesday matinee cast of Hamilton” the Blue Jays trotted out in the opener shouldn’t take away from his achievement. The Diamondbacks didn’t think he could hack MLB hitters and the Reds—as bereft a pitching staff as any team in baseball—took him for all of 10 minutes in the Rule 5 draft before sending him to Kansas City for, essentially, whatever was lying around Dayton Moore’s office at the time. Anyway, the Jays opened the scoring because any time Kansas City scores first it seems they’re guaranteed to lose, although the same could be said anytime the Royals play in a year when they’re 36-82. On the fourth offering of the game from Keller, Devon Travis lifted a fly ball to left that carried right out of the park. The Royals would not allow another run. 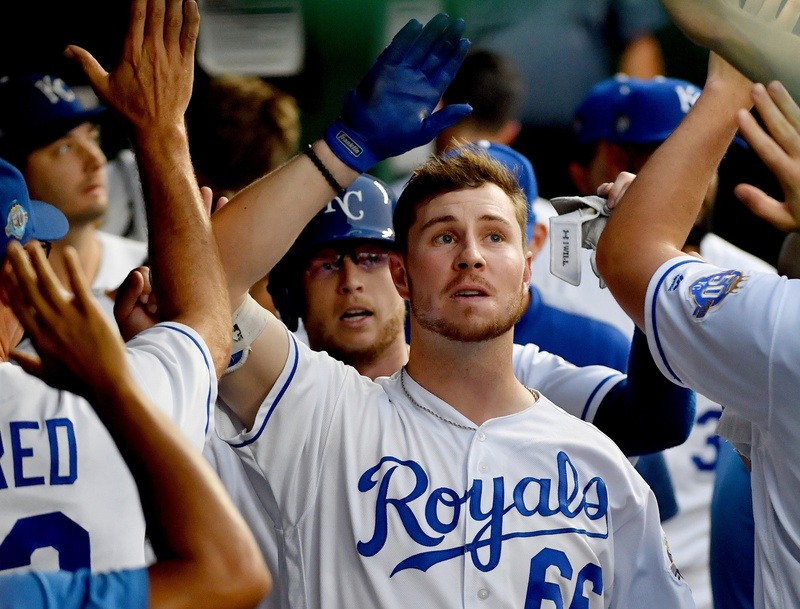 This was a game of double plays, featuring six in all, and the Royals did the honor of having a potential rally snuffed out first when Salvador Perez bounced into a 5-4-3 to end the first inning after a leadoff single by Whit Merrifield. However, the Sheriff was on the receiving end of an Alex Gordon laser to end the second by throwing out Russell Martin at the plate as he tried to score from second on a Danny Jansen single. With two down in the second, the Royals started a rally of their own and this one yielded results. Brett Phillips walked to bring up Ryan O’Hearn and the burly lefty mashed a ball into the left field bullpen for an oppo-taco to put the Royals ahead for good. Perez again came through in the field to end the fourth inning, when Keller fanned Martin and Perez nailed Grichuk on a steal attempt. The Royals would add another run from O’Hearn in the fourth thanks to a bases-loaded, no-out walk; that situation should’ve yielded more fruit, but Adalberto Mondesi whiffed and Alcides Escobar bounced into a 6-4-3 double play. Curtis Granderson (still playing, unbeknownst to me) led off the sixth with a single but was snuffed out on Justin Smoak’s double play ball. Escobar—again—grounded into a double play in the seventh. The Jays tried to get a two-out rally going against Brandon Maurer—in truth, probably the guy most opponents want to see when trying to get a two-out rally going in the eighth—after Jansen singled and Granderson walked. However, Travis’ liner to center was easily tracked down by Phillips and the Jays went quietly in the ninth, ending the game on—what else?—a 6-4-3 double-play that featured a nice backhanded flip by Escobar to start it. The Bright Spot: Keller and O’Hearn are (rightfully) gonna get the headlines for this one, but Whit Merrifield had three hits to hopefully right the ship after a 2-for-24 skid. The Nadir: Even when nothing bad happens, I’m constantly terrified of Maurer. Also, you’d like more out of your No. 2 and No. 3 hitters than a combined 0-for-8, but let’s be honest, in a real lineup Alex Gordon isn’t hitting second. The Next Step: Heath Fillmyer looks to build off a quality start in his last outing when the Royals host Ryan Borucki and the Jays at 7:15 p.m. (CT) at Kauffman, Tuesday. Fillmyer! Borucki! It’s August baseball and we’re playing out the string!